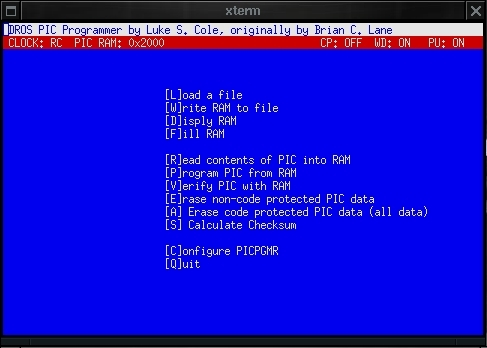 PICPrg is a fast Linux command line (or ncurses) program, to program any Microchip PIC microcontroller using the PC parallel port interface. 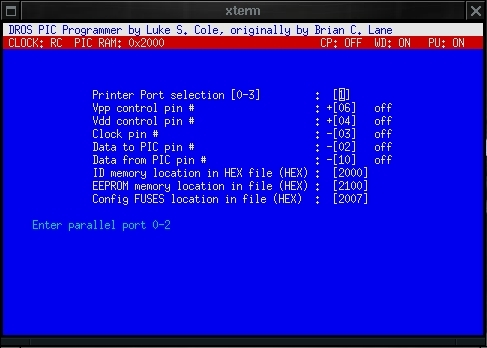 Any parallel port PIC programmer hardware can be used, simply edit the configuration file or use the ncurses configuration menu. This project was originally created and managed by Brian C. Lane, however Luke Cole has now taken over the project and since have re-implemented all the core functions to provide a more efficient programmer and provide full functionality for any Microchip PIC microcontroller. Please see the latest release notes below for a more detailed description of the changes. Download the PICPrg-3.0 code tarball. Uncompress the tarball and untar the code. Install the code (as root). Create the configuration file (~/.picprgrc) manually or use the ncurses configuration menu (as root). 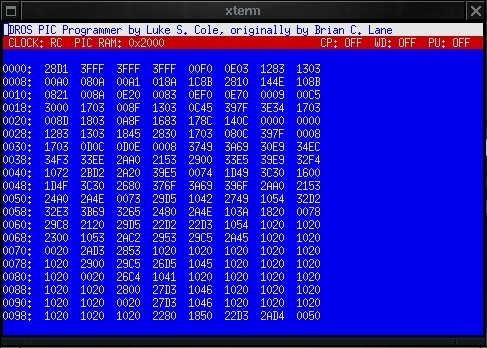 Re-implemented the programming, read and verify PIC functions so they follow the PIC programming guide! Increased programming speed of a PIC dramatically via not erasing data before programming and only programming changed data! Made code readable! (including a full syntax change). Fixed problems with programmers that use open collector outputs, like the PIC-1 from ITUtech. Error setting the config register (non-RC osc. wouldn't work). Error and Confusion with Intel 16 file format cleared up. It now will read Intel 16 and 8m files automaticly. Added display of addresses as they are being read, written, and verified. Added support for no-color mode (-m switch or automatic detection). GNU provide two packages gputils, for compiling assembly programs and gpsim provides simulation features. Also available within the Debian/Ubuntu package tree. Hi-Tech provide a free (but limited) C compiler called PICC Lite. If you require other devices, it is recommend you buy the expensive PICC/PICC18 ($950USD). CCS is much cheaper ($175USD), but not as flexible and gcc-like as the Hi-Tech version. Otherwise code up a nice free PIC C compiler for us all. piklab-prog is a good command line program that supports many USB and Serial programmers, such as the Microchip PICkit 2 (50USD) and gpsim. Visit http://piklab.sf.net for more information. NOTE: Currently it is recommenced you download the development source via svn.